A current BOLT artist in residency at the Chicago Artist Coalition, he’s in the midst of his solo exhibition, "A Thin Blue Line." As he sits surrounded by his work, explaining how conflict plays into what he creates, he questions everything. 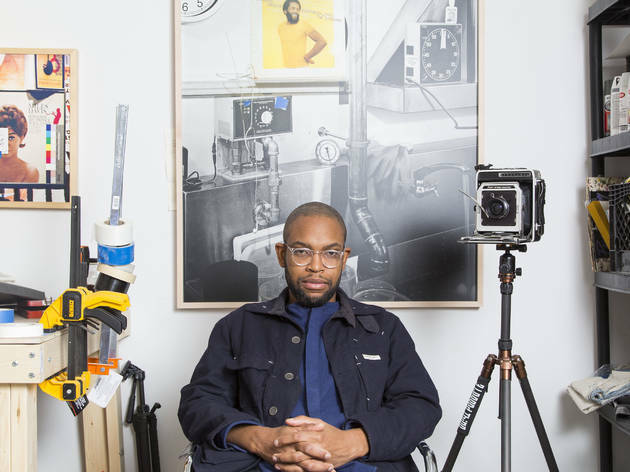 Considering his background and training—he’s a 2015 MFA graduate from Yale School of Art and a 2013 BFA graduate from the School of the Art Institute of Chicago—it’s only fitting. 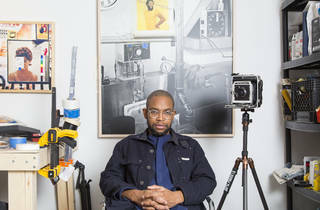 Alekhuogie’s career began in a photo chemistry class at the University of California at Berkeley while he was pursuing a social science degree. Shooting exclusively on film, Alekhuogie developed a love for the analog, or as he puts it, “I became obsessed with process and craft.” Influenced by a background in sociology and ethnomusicology he began using photography as a means to involve himself in California's hip-hop scene in 2007, inadvertently studying the parallels between music and the social climate. While Alekhuogie's art continues to evolve, the emphasis on dissonance is constant. There's a tension present in his "Baptism" series, a closer look at the ideology behind a pilgrimage, and his more abstract work, "Negative Positive," which examines commercial fetishism. Alekhuogie definitely questions­­, whether it's the humanist at odds with religion in the "Baptism" series or the kid who desires Nikes at war with the culture of commercialism in "Negative Positive." Each of his works functions as an eloquent argument that has pushed and tested the limitations of itself. "A Thin Blue Line" is currently on display at the Chicago Artist Coalition until February 25. Jaclyn is the photo editor at Time Out Chicago. Follow her on Instagram @Cosmic_Ghost.